"Take Your Pills" is an automatic calling program that is part of the CARE (Call Reassurance) program from Database Systems Corp. (DSC). DSC has been developing computer technology solutions since 1978 and is recognized as a quality provider of call management products including phone systems and application development services. DSC is also a leading provider of outsourced calling programs including automatic phone answering services and call reminder services DSC provides both voice message and text messaging reminders. Remembering to take prescription medications every day can be a chore, but it can also be a very important process in maintaining a healthy lifestyle. If you have too many medications to track or perhaps you are just forgetful, then our medication reminder service can help you. CARE (Call Reassurance) phone service was created by DSC as a community service programs that calls seniors and home alone individuals. Using CARE phone systems, community organizations can automatically call individuals, reminding them to take their medications at their proper times. DSC provides an individual medical reminder service that automatically calls a subscriber and plays a recorded message with a reminder to take prescribed medications. CARE (Call Reassurance) systems have been installed throughout the U.S. and Canada. DSC's CARE systems are also installed at our own data processing centers and subscribers can enroll online for these services on an individual basis. Contact DSC to learn more about our automatic medical reminders for elderly calling service. DSC can send automatic "Take Your Pills" reminder messages as well as prescription medication refill reminders to anyone who has access to a cell phone or telephone. A pre-recorded phone message (or SMS message) can be played to either to the individual subscriber or to an answering machine. How Does Our Pill Reminder Service Work? The CARE (Call Reassurance) medication alarm service calls subscribers (on the days and times they specify) and greets them with a recorded message. Medication reminder subscribers are instructed to "Press 1" to acknowledge the calls. If after several attempts the subscriber does not answer the phone or acknowledge the call, CARE will automatically call the appointed contact(s), playing an alert message, and send email alerts as well. Two contacts can be specified and CARE will alternately call each one until the call is acknowledged (for up to 1 hour). 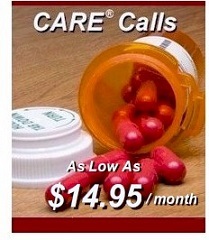 CARE provides a complete online activity log including the status of each call as well as schedule changes. 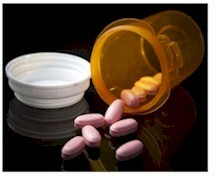 Contact DSC to learn more about our medical calling services that send pill reminders to seniors.